Consideration of appropriate safety criteria (usually an allowable shock voltage) is required for all electrical assets that form part of the network. Consideration should be made for substations (both inside and outside) and for the accessible portions of the powerlines and cables. 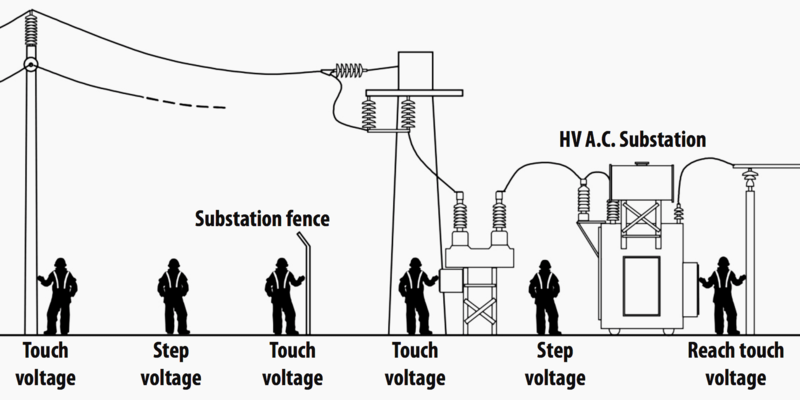 As fault current can be coupled to non-power system plant, so it is required to also consider the safety requirements at those locations outside the substations and easements. The specific locations will represent a different risk profile by virtue of the fact that there will be different coincident probabilities of system events and human contacts and different series impedance (for example, footwear and surface coverings). Conductive and inductive coupling into non-power system plant such as communications infrastructure, telecoms, pipelines and conveyors. Not all risk is imposed by the earthing system. There are external factors that may also impact upon the earthing system resulting in a change in the risk profile of the installation. Figure below summarises the main risk elements in each category. Some external factors that need to be addressed (during design and installation) are theft and/or vandalism of earth system components. Consideration should be given to protecting exposed components and/or monitoring key components to ensure an acceptable risk profile. The interaction between the substation or powerline earthing systems and secondary systems (for example, SCADA) needs also to be considered as those systems can adversely affect each other. All life activities involve some form of inherent risk. The tolerability of injury or death to a member of the public is therefore dependent upon several factors including the types of hazards, the control measures implemented, frequency of occurrence, the likelihood of actions of the individual(s) exposed and the associated consequences. Risk in this context is defined as ‘the chance of something happening that will have an impact on objectives‘ (i.e. a combination of the consequences of an event and their likelihood, frequency or probability). The risk associated with a hazard is determined using a risk assessment process in which hazards are identified, analysed using quantitative methods and qualitatively assessed against specific criteria. Once the risks are evaluated, the appropriate risk treatment process shall be implemented where appropriate to effectively and efficiently manage the risks. maximum allowable earth resistance is 8 ohms. Thanks for your best technical knowledge. My need is HTV/LTV Powe Distribution System From Generating Station To Consumers End Supply.Over Hand And Under Ground Net Work . Iam not able to download power system earthing guide it is showing invalid format. please change format. plz keep me on list. I want information about Basics of stackless earth resistance meters.